Knowledge sharing through your service desk is extremely important and the topic should really receive much more coverage than it does. There are several reasons for this including the reduction of resolution times massively, but it also promotes a better working culture. But to really push this cultural shift through in your organization, there are a few things you need to do. The most important process in really implementing a culture of knowledge sharing in your organization is to not make it an optional practice. Instead, sharing knowledge will now be a mandatory part of solving any call. 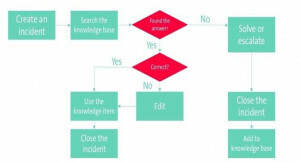 A part of your operator’s procedure is now to always check the Knowledge Base. If he or she doesn’t find a knowledge item about a specific request, the portal should be updated to help the rest of the team in the future. It may sound harsh, but it’s not. For sure, at the start it may well be difficult for all operators to remember to add knowledge items every time. In the long run, though, these knowledge items will provide immense economies of scale, make all operator’s lives easier and improve the efficiency of the service desk. To really kick this off, you need some sort of incentives. We recommend some competitions or something similarly engaging, like a “knowledge base contributor of the week” award, or maybe a “focus day” where everyone has to focus on adding knowledge articles after each call they solve. Just be sure you show the team the benefits of the new system, with continuously updated and motivating statistics. However you do it, the important thing is to promote a culture of knowledge sharing. Because in the end, everyone will benefit from it. Those organizations that use service desks both before and after they implement knowledge sharing as part of their culture, and the difference in team spirit in the department is incredible.